I'm so freaking excited and I just can't hide it! My new book is finally out for you to devour! This book was one of my most dear labor of loves. It is the culmination of a lifetime of learning and all the herbal classes I have taught. 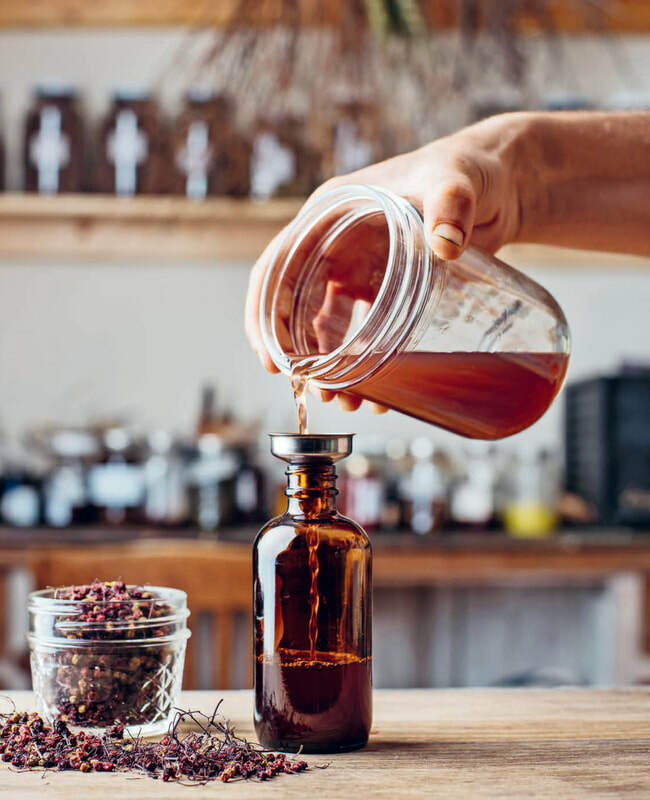 If you've ever been to one of my classes, you'll recognize some recipes and some teachings, but they go further in and have some twists and tweaks here and there to take you deeper into your herbal journey. 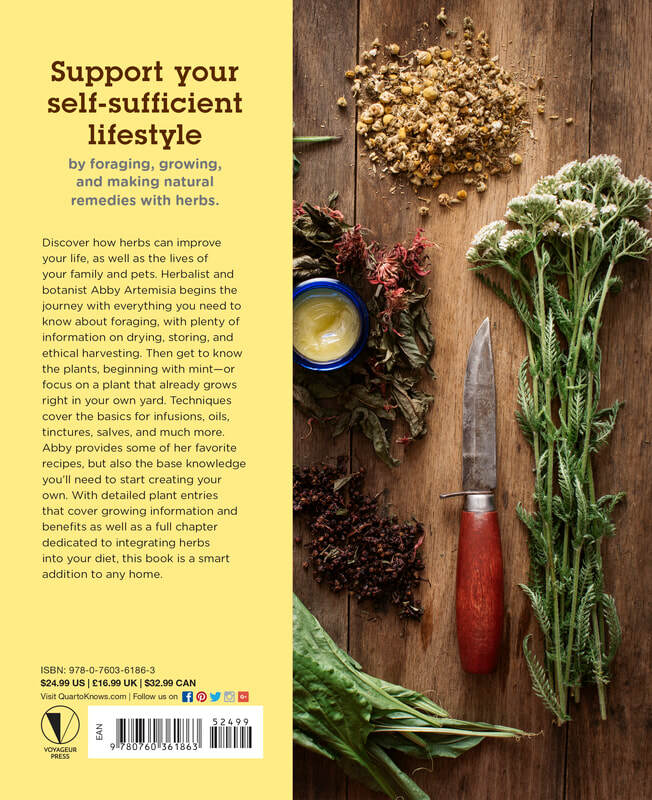 And if you're brand new to herbalism, the book lays a sturdy and accessible foundation to make it easy for your to walk right in. 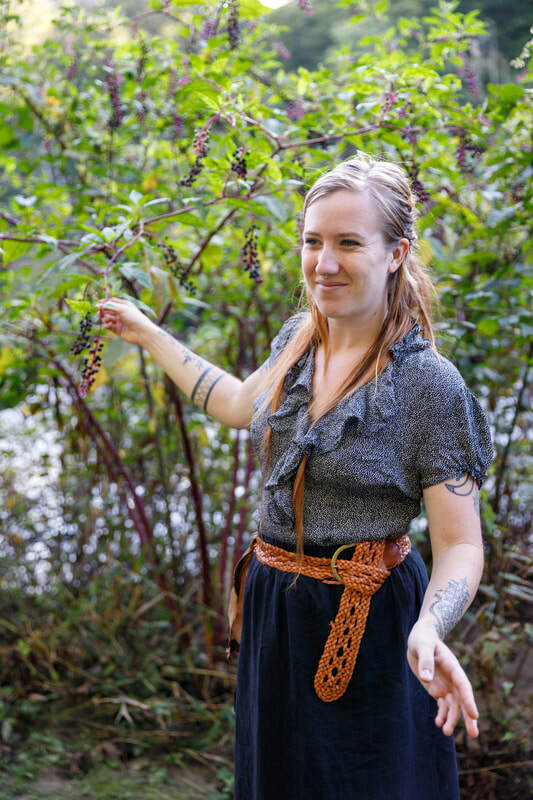 Tons of herbal recipes and Materia medica (an informative herbal glossary) with growing and foraging tips at the end of every chapter, are combined with gorgeous pictures from my apothecary (including my hands in all kinds of interesting poses) from the amazing photographer, Jack Sorokin. 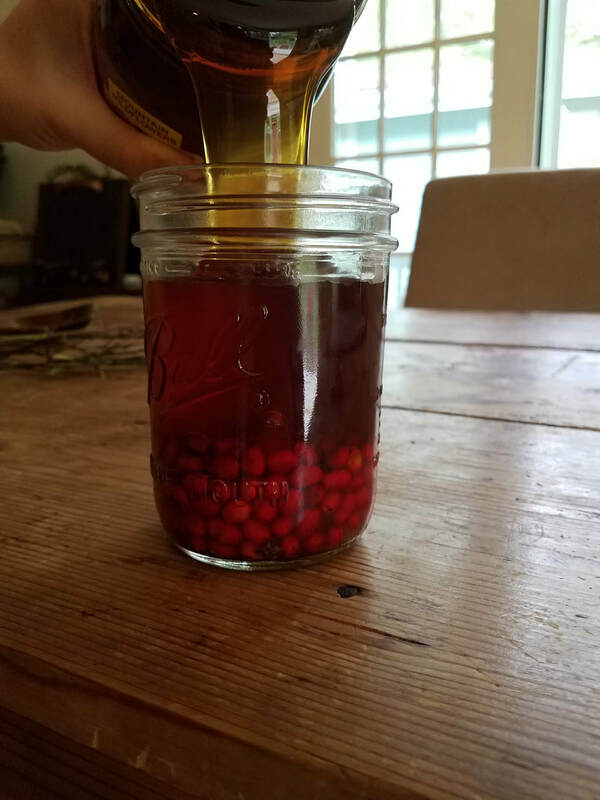 I wanted to give you a little free and helpful preview, so here's my elderberry and cough syrup recipes from the book (because I appreciate you so much). 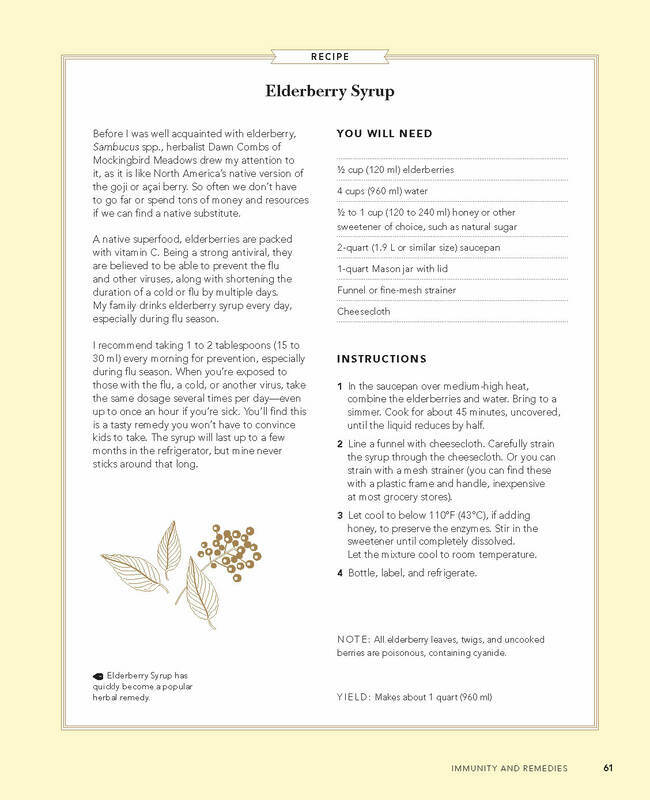 Use the elderberry syrup to keep you healthy the rest of the winter and the cough syrup, just in case you need it. Try the recipes and let me know how it goes and your favorite twists on these recipes. 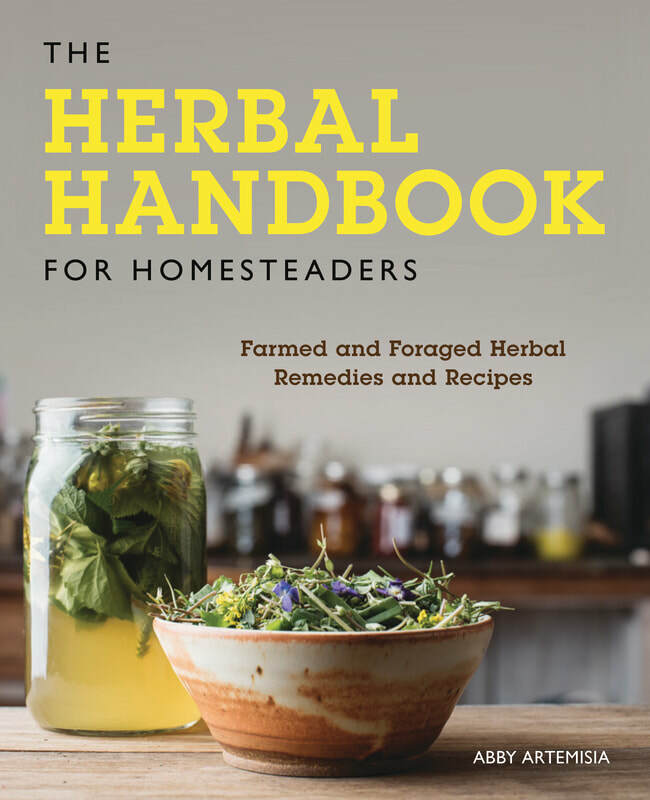 You can get your own copy of the Herbal Handbook for Homesteaders, and they make great gifts for friends and family, on Amazon here or buy it from me, here on my new website, for a signed copy made out to you or whomever you'd like. 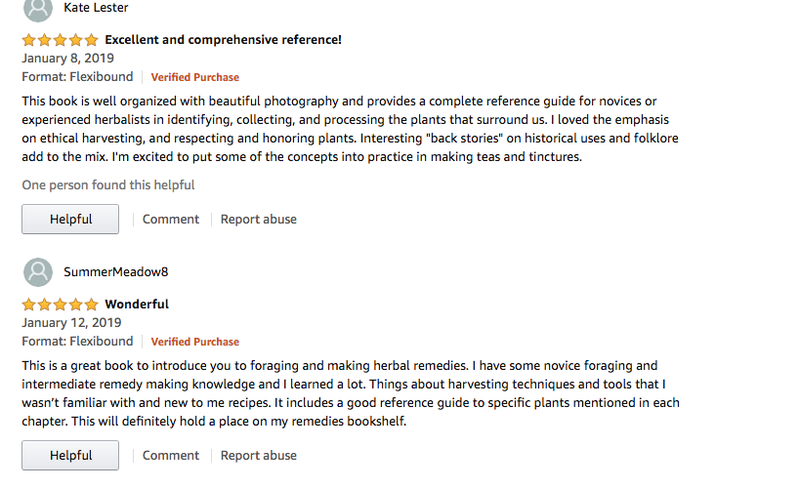 If you buy from Amazon, please leave a review, so we can help as many people as possible see it and empower themselves with their own herbal healthcare. Thanks so much to all of you for your support through the years! This book wouldn't be here if it weren't for your desire to learn. 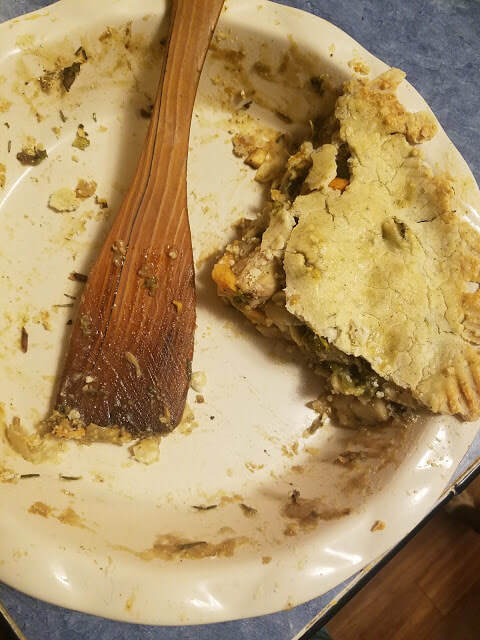 ​You may be wondering, "What the heck is 'Lion Pot Pie' and why would I want to eat it?!" Well, I'm here to say, "Have no fear, and get your taste buds primed and ready for some scrumptiousness!" Lion Pot Pie is my cute name for Lion's Mane mushroom pot pie. 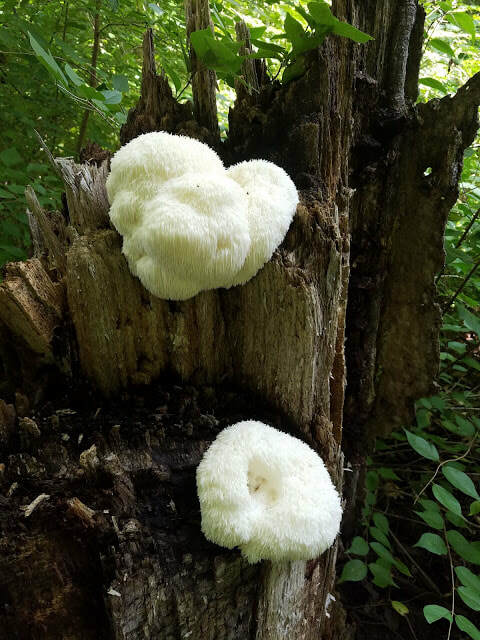 Lion's mane, also referred to as monkey head mushroom, bearded tooth, satyr's beard, or yamabushitake, is one of several species of the Hericium genus of mushrooms, usually Hericium erinaceus. Both parts of the Latin name mean hedgehog (even though this is not the mushroom usually referred to as a "hedgehog"), and you can hopefully see why from this picture of one I found a couple weeks ago on a tree in South Carolina and a closeup of its spiny appearance. Check out those spines, a great tool for ID! 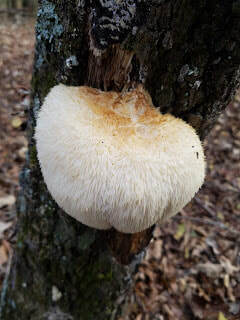 Fruiting Body: 8–16 cm across; consisting of one, unbranched clump of 1-5 cm long, soft spines hanging from a tough, hidden base that is attached to the tree; spines white, or in age discoloring brownish to yellowish. I find this mushroom, it's a struggle to make a decision: eat it or make medicine with it? Hopefully, I find enough for both because both are fantastic! It is one of the tastiest mushrooms I know, some people say it tastes like delicious seafood, and one of the most medicinal. The very first time I foraged this mushroom, I made a very unfortunate mistake: I washed it. Believe me, it was one of my best lessons and I'll never do that again! Some mushrooms, this one especially, are like big sponges; they soak up every bit of water they're exposed to. Better to use a clean paintbrush, toothbrush, or damp cloth, or it will end up tasting like a sponge! It's also said to be anticarcinogenic and immunomodulating, like many other wild mushrooms, which is why I like to eat and/or take my mushrooms every day! I got the idea for this recipe as a result of necessity being the true mother of invention! We were overloaded with a bunch of lion's mane (a good problem to have!) and were getting tired of eating pan sauteed mushrooms, so I looked around the kitchen and got creative. 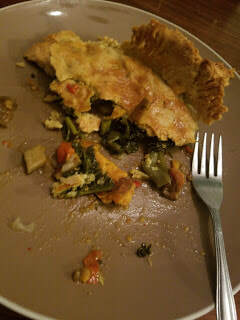 I found a recipe for gluten free chicken pot pie and tweaked it a little. I especially liked the recipe because it had an herb crust and only a top crust. Here's what I came up with! This can be vegan if you choose the coconut oil option and egg substitute (here's a recipe for making your own from flax seeds). If you'd rather have a bottom crust and a top crust, just double the crust recipe. If you only have access to dried lion's mane, rehydrate by soaking in water first. Then, saute for a few minutes in a dry pan, until most of the moisture evaporates. In medium size mixing bowl, mix together flour, salt, and rosemary. Mash butter or coconut oil with a fork and mix into dry ingredients until crumbly. Beat the egg in a small bowl and pour 3 Tbsp into the dough. Add cold water 1 Tbsp at a time, mixing after each Tbsp. Stop when the dough forms a ball. 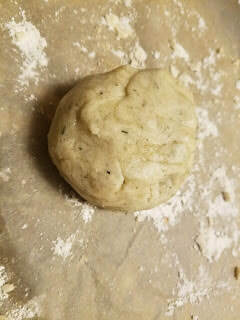 Put dough in a container and refrigerate while making the filling. You can also do this step a day ahead of time. If you put the crust in the fridge more than 30 minutes ago, take it out at least an hour before starting to make filling to soften (especially if you used coconut oil). Melt 1 Tbsp butter or oil over medium heat in large skillet. 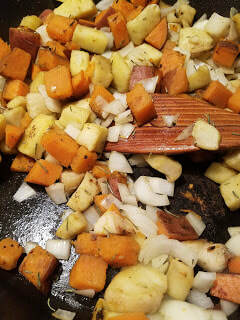 Add sweet potatoes and water. Cover and let simmer for 8 minutes. Then remove lid and continue cooking until water is cooked off. Grease 9 inch pie pan (equal size cast iron pan will work, too). 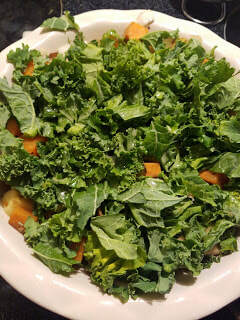 Pour in contents of pan and cover with kale. Pour Stock or bouillon mix into a 2 cup measuring cup or small bowl. Use a piece of parchment paper to prevent the crust from sticking. Coat countertop or parchment paper with a dusting of flour and smooth some over your rolling pin. 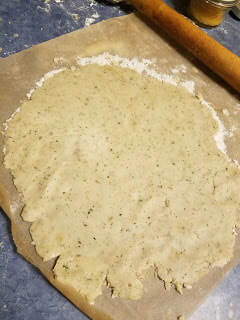 Roll crust until it’s the right size to fit over the filling and to the edges of the pan. Gently drape parchment paper, upside down, over the filling and loosen crust so it covers filling. Take a fork and press the edges that overlap the pan (running perpendicular to the edges of the pan). Cut small slits with a knife in a few spots in the crust to vent the steam. Brush gently with remaining egg. Bake for 30 minutes or until crust starts to brown and the filling bubbles. Cool for 5 minutes, cut and enjoy! ​Please let me know how it turns out and any thoughts or questions in the comments section below. Happy eating! Oh this plant, what can I even say? It sells itself through its loveliness, its bright yellow brilliance standing in giant pre-bouquet bunches in the meadow and smaller huddles in the forest. It's late in the growing season yellow seems to internalize sunshine and hold it for us for the rest of the year. I love to preserve it partly for that purpose. I am currently reading my new favorite book, Braiding Sweetgrass by Robin Wall Kimmerer (I am in love with this book, please check it out), in which the author talks about trying to figure out why goldenrod and purple asters look so beautiful next to each other. When she asked this before starting college for botany, she was told she should major in art instead. She was disappointed, understandably, that no one had an answer for her and didn't think this was an important part of botany. I agree with that sentiment. She later found out that, alone, both of these plants are wonderful pollinator attractors, but together they're a pollinator attractor super duo! So their collaboration is mutually beneficial, woah good metaphor for life! 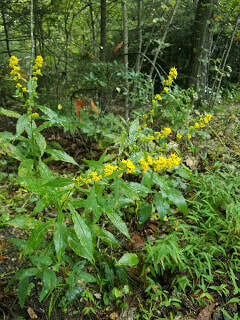 There's a ton of goldenrod species that are native to the USA and a few more in other countries. There's about 75 species in this region (according to the Flora of the Southern and Mid-Atlantic States by Alan Weakley)! They're not difficult to identify and I don't think there's anything else, at least around here, that looks similar to them and blooms at the same time of year. However, as Juliet Blankespoor of Chestnut Herb School says (in her article "Goldenrod: The Bees Knees and Urethras Love it Too"), they can look close to another plant in the aster family, commonly called ragwort (not ragweed, which we'll talk about in a minute). Though it would be very uncommon to see a ragwort blooming this time of year. 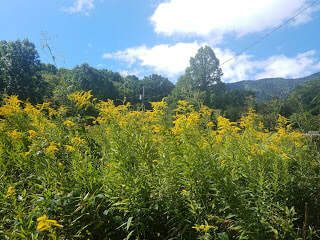 As you can see above, the sturcture of the goldenrod plants can vary greatly. The top picture was in an open field, and the bottom on the edge of a woodland. They can have flowers only near the top of the plant on branching stems, or flowers in clusters along the central stem, between the leaves, and interesting structures in between. As I said, they're in the aster family, Asteraceae, along with about one of every nine plants in the USA. If something has a flower that looks like the shape of a daisy (no matter size or color), it's mostly in the aster family. 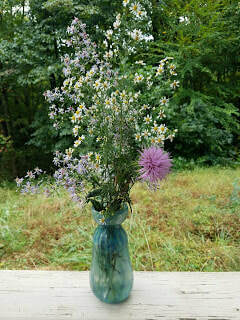 Though there are some asters that don't look this way, like the thistle below. They also have alternate, generally long oval-ish or narrow leaves with coarse teeth that come to a point at the ends. You'll often see them with giant galls, or hard ball-like structures on the stem. These are caused as a result of the goldenrod gall fly. You can often cut them open carefully and find the living larva getting ready to eat its way out. 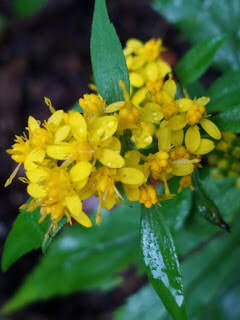 The Latin name of goldenrod's genus is Solidago, which means "to heal or make whole". This comes from one of its other common names, "woundwort", (referrring especially to the European species Solidago virgaurea) as it was found to be helpful applied topically for healing or binding tissue back together. ​I like eating the flowers, partially just because it's fun to eat flowers. My favorite thing to make from them is goldenrod infused honey. 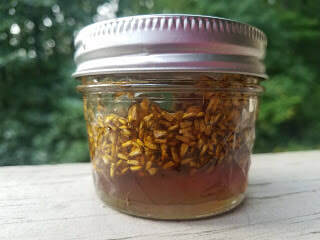 This isn't the goldenrod honey you'll find at the store that involves the pollen of the goldenrod, it's made by harvesting the flowers, letting them dry a little (to avoid mold) and infusing them in honey for a couple weeks (check out the recipe in my new book, The Herbal Handbook for Homesteaders). I love to leave the flowers in for a whole beautiful sensory experience when I eat it. Though some people (not me) don't like the slightly musky taste of the leaves, they make a lovely mild tea. I include the flowers and the leaves in an infusion, chopping coarsely and steeping, covered, for 20 minutes or more. 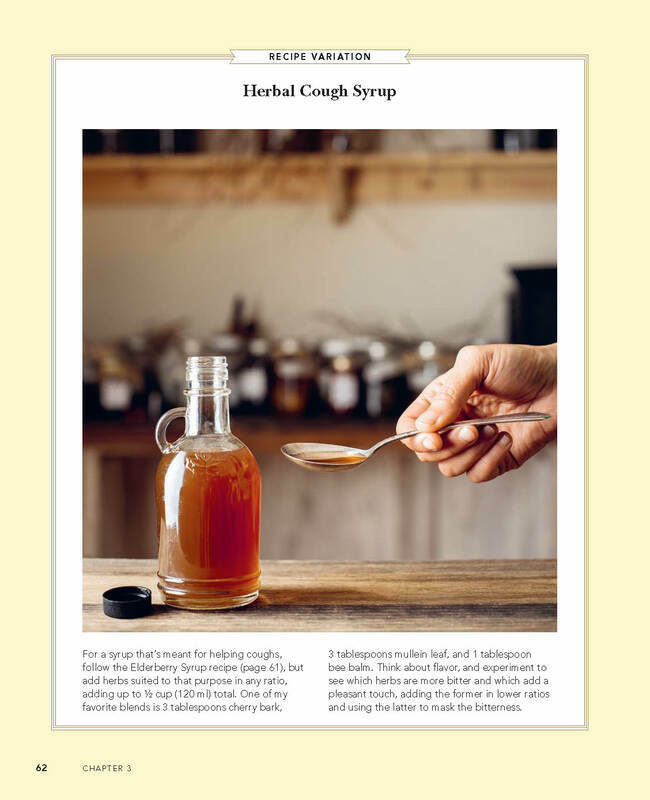 This is a favorite tea of mine for the allergy season, as it's an awesome antihistamine, decongestant, and anti-inflammatory (basically anti-allergy). 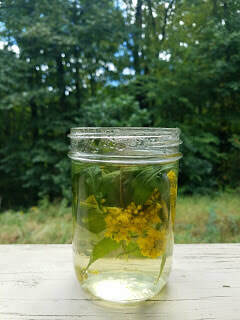 I also include goldenrod in allergy tinctures, adding a mucilaginous (demulcent) herb, like marshmallow root or rose of Sharon, to counteract the drying effect it can have. 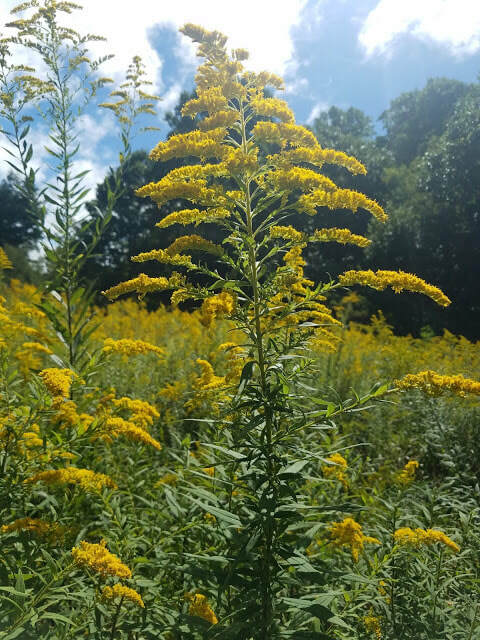 Many people wrongly accuse goldenrod for their fall allergies, when it's actually ragweed, that's blooming at the same time, that is the culprit. Ragweed pollen is tiny and flies easily, getting into our sinuses and making us miserable. However, goldenrod pollen is giant and sticky, so doesn't fly well. It makes a fabulous ragweed antidote. My student, Lisa, gave me a fabulous gift of goldenrod infused oil. Because goldenrod is anti-inflammatory, it works wonders topically for inflammation, and is especially helpful for menstrual cramps. Try it! It's also a bladder and kidney tonic, helpful with urinary incontinence and urinary tract infections. Talk to your healthcare practitioner and do more research before trying, it can be contraindicated with chronic liver or kidney disorders or when diuretics are contraindicated. 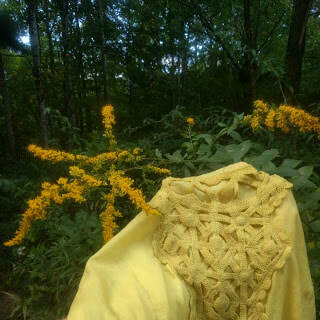 Hopefully, now you've seen the light, the sunshiny brilliance of goldenrod that is! Let me know if you try the tea or honey, or if there's something else you love to do with goldenrod, in the comments below. 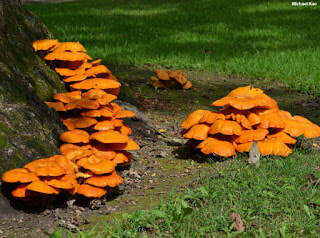 Actually, with all the rain we've had, there's a cornucopia of fungi among us! It always amazes me when I come upon an abundance of choice edibles (that's what the fungal nerds call the super tasty mushrooms), and no one has noticed or harvested them. 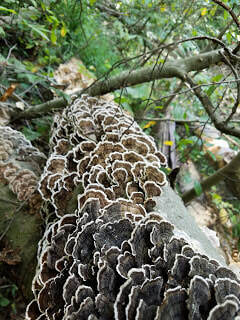 Mushrooms are sometimes called the meat of the forest because they have so much protein in them. So, if you're a vegetarian, looking for a free protein-rich meal, or wanting to know how to survive in the woods with the least amount of effort (hunting takes a lot of energy), then knowing your mushrooms is priceless! Of course, I have to start with the obligatory disclaimer, becauase you may have heard the famous saying, "There are old mushroom hunters, and there are bold mushroom hunters, but there's no old, bold mushroom hunters!" It's for real, y'all! So, I'll say it again, Always have 100% positive identification of anything wild before you eat it! And if you don't know, ask. There's probably a local botanist/mycologist/forager who can tell you. If you can, go on a walk with someone knowledgeable (hint, hint, check out my upcoming walks here). To continue with that disclaimer, it's a lot harder and more deceptive to learn mushrooms (and plants) from books. The following is just an introduction. Please make sure you know before you eat! Also, none of this information is backed by the FDA, it's been compiled from research of studies and traditional history. 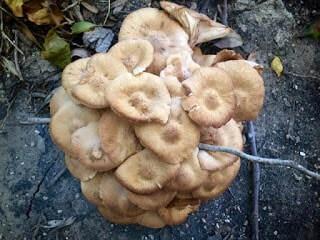 These mushrooms are species that I've seen growing in the eastern US, but may be more widespread depending on species. Do you have any favorite pages or sites? Please share in the comments. And on with the mushrooms! Do they look like tiny turkey's tails to you? I've seen most abundantly in the Midwest, though sometimes here in the southern US, too. Being hard and almost woody, it's a medicinal, not an edible. There are some look-alikes, probably not poisonous and very possibly medicinal, too, that just haven't been studied much. The way you tell them apart from other species is the pore surface (or underneath part with the little holes). 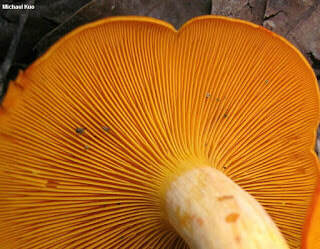 Most mushrooms have pores or gills (like a portabella). These should have a white pore surface with tiny pores just visible to the naked eye, if you have good eyesight. The tops can also vary in color anywhere from brown to gray to blue to green. 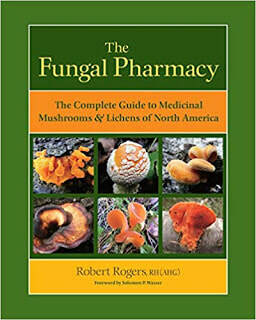 The current research is showing that many wild mushrooms are not only medicinal, but anticarcinogenic, too. 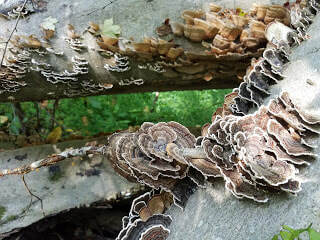 This means they supposedly fight and prevent cancer, and turkey tails are supposed to be one of the best. They are also said to be immunomodulators as well, meaning they are believed to be safe for folks with autoimmune disorders because, instead of boosting the immune system, they take it from where it is to where it needs to be. Nature is so cool, right?! Check out how they can grow right around a stick! Can you see the tiny pores? If you're not ready to make your own tincture, you can find my lovingly wildcrafted four mushroom blend here and support my work. 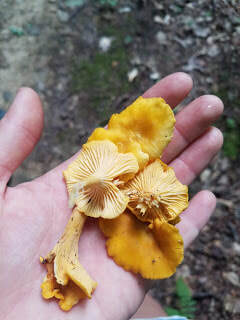 Chanterelles are a favorite eating species for me, partly becauses they're so abundant. 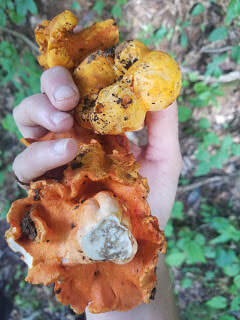 I tend to see them in July, but I just found this big one in West Virginia on September 2nd. They like to grow on the edge of old road cuts, so look for them on the side of trails. Their spores (kind of like plant seeds) tend to wash downhill. If you see them, make sure to look around the area, and especially up and downhill from where you find them. They're fragrant and lovely, often said to smell like apricots. 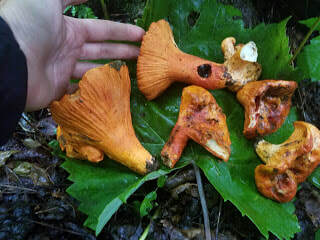 The trick to chanterelle identification is that they don't have true gills. They're sometimes called ridges. Can you see them here? Ridges not gills. Also notice the way they fork at the edges. 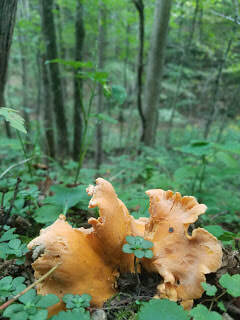 Chanterelles also grow on the ground individually, as opposed to their most commonly confused poisonous look-alike, Jack-o-lantern (Omphalotus species), which grows on wood and in clusters. However, that can be slightly deceiving since they could be growing on decaying buried wood or roots. The coolest thing about Jack-o-lanterns is how they got their name, because they often glow in the dark! They are also supposed to make a good purple dye, too. Unless you absolutely can't help it, just don't do it. 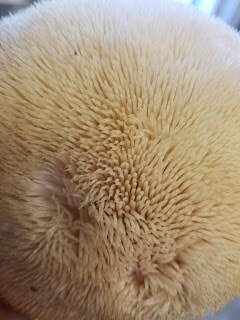 Mushrooms (especially lion's mane) are like sponges and can soak up lots of water. If you have to do it, dry saute them in the pan until they dry, before adding butter/oil. Usually just dry brushing them will do it, though. Mushrooms have a constituent in their cell walls called chitin, which also makes up the exoskeleton of insects and crustaceans (arthropods), which most of us can't digest raw. Interestingly enough, some folks from Russia have a special enzyme, called chitinase, that allows them to digest chitin. I'm guessing this is because they evolved eating a lot of mushrooms. 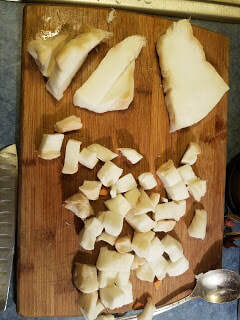 Cut up any tender parts, saving the hard stalks (or stipe, if you want to get technical about it) for soup stock. Use lots of butter or oil! Again, they're like sponges, so they'll soak it right up. Really garlic and salt are the only other things you need, though ramp salt or a nice za'atar blend give it an extra fantastic taste. Give the mushrooms some personal space. Even if they don't seem wet, they'll release water when they cook. If they're too close, they'll just soak it back up. Cook well, until they're crisp and browned on the edges. Some mushrooms can be toxic if not well cooked. This technique will give you the best taste, too. Oysters are probably the most abundant edible species with the longest season that you'll find in this region. This is partly because they're not very picky about which tree species they grow on. I've seen them on ashes and tulip poplars, but there are many more, and they can grow on living or dead trees. You have to catch them at the right time. Too late, and they're dried out, too wet, and they're mushy and gross. This is a good one to tap the top, because little tiny beetles like to hide in the gills. The oysters have a very specific smell to them that you'll always know once you've smelled them. These are pretty rare to see, but I had to include them because they're just so amazing. The milkcaps are a kind of mushroom that exude a milk-like substance from the gills, especially when they're fresh. They're not all edible, but these are. These even exude a blue milk! 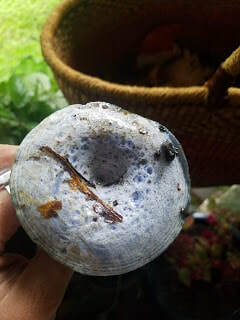 My friend and awesome forager, Jenifer, was remarking how incredible it is to see something that's naturally blue and doesn't make you vomit (or want to) when you eat it. Ditto to that! There is one thing that makes honey mushrooms super spectacular. They are the largest living organism on earth! They cover almost 2,400 acres in Oregon!!! While it's recommended to gather wild mushrooms in mesh bags to help spread the spores, the opposite is true for these. They can destroy trees, so collect them in non-mesh bags. 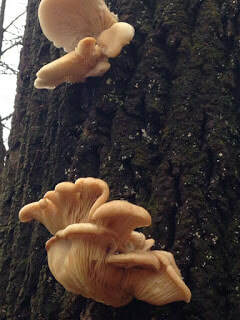 Honey mushrooms are definitely at leaste a 202 level mushroom, i.e. not for beginners! This is because they could be confused with a very poisonous mushroom called The Deadly Galerina. Here's what that one looks like. 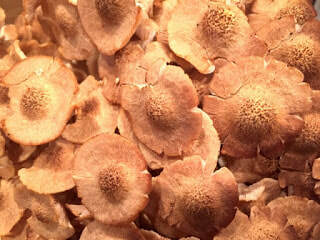 There are ringless honey mushroom and ringed honey mushrooms. I find mostly the ringless in the Midwest, which are also blamed for causing possible gastric upset, which can possibly be prevented by parboiling them first. I've never experienced any problems with them. But it brings up a good point. For any mushrooms you're trying for the first time, it's a good idea to only try a tiny bit and wait 24 hours to see if you have a reaction. Anyone can be allergic to anything. I've heard a couple of reasons why honeys are called honeys. One is because of their buff honey color. The other is because they get sticky on top when they get wet. There are several ways to tell them apart from the deadly Galerina. One way is the little hairy dots on top of the cap of ringless honeys. The ringed honeys have a ring of flesh around the stalk. The best way to tell them apart, though, is the spore print. The spores are white (as opposed to the deadly Garlerina's brown spores). You can take a spore print by putting the cap face down on newspaper and covering it with a bowl, then waiting a few hours. You'll have a beautiful print in the shape of the mushroom cap and gills. However, usually you can cheat with honeys. 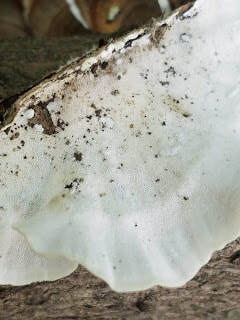 Since they grow in clusters and have prolific spores, their spores can often be seen on the caps of the lower mushrooms in the cluster, where they fell. Once again, do not try eating this one at home until it's been shown to you by a trusted teacher! 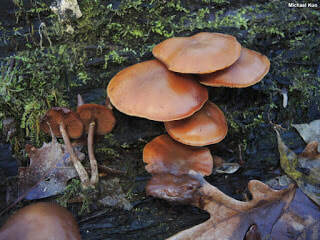 Look here for more info on the Deadly Galerina and here for more info on Honey Mushrooms. 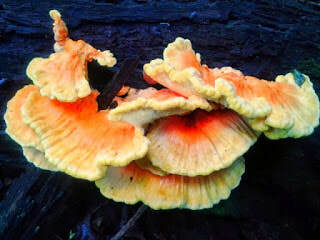 Ahh, good old Chicken of the Woods. I have a special connection to this one partly because I'm from Cincinnati and the cincinnatus part came from a high school teacher in Cincinnati who was the first one recorded as describing it and giving it this name. I wonder what the Native American call it. 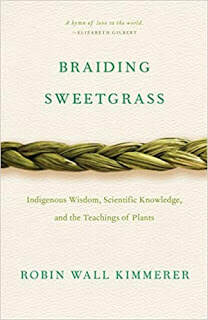 (I'm reading the fabulous book, Braiding Sweetgrass, and it's inspiring me to curiosity.) That species has a white to pinkish underside, while the sulphureus species got its name for the yellow underside. It's a very beefy mushroom, tasting like chicken. 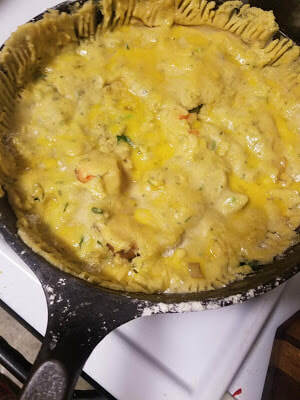 It can take awhile to soften it up, so my favorite thing to do with it is make "chicken" curry. Some people get gastric upset from this one, which I suspect is a result of not cooking it long enough. When you harvest it, make sure to get it while it's still semi-tender, or just take the more tender outer edges. It likes to grow on oaks especially. I made this one huge, so you could see the detail. 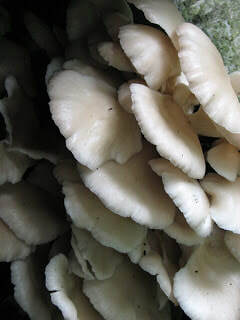 Sometimes some related species are called comb's tooth mushroom. I think that kind of describes it, too. 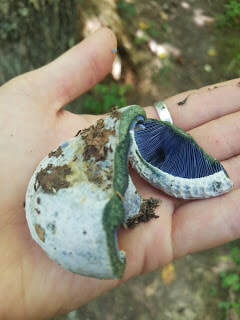 My same foraging friend, Jenifer, and I just found about 7 of these in the woods in Cincinnati. There is something magical that happens when you've been foraging for awhile. The plants and mushrooms become old friends. Every year it's like a homecoming when you see them again for the first time. But then there are some that you only see very rarely, and then it's super special, especially when they hold such special medicine. That's what happened when we saw these. We were about 3/4 through a pretty rough, overgrown hike through brambles and thousands of burs. It was Cincinnati summer, so in the 90s with like a bajillion percent humidity. We were worn. Then, I just happened to turn around at the exact right moment and gasped. Jenifer turned at the sound and shrieked. There's almost nothing better than foraging with someone who knows and appreciates the forageables as much as you do. These are a species that can cause a major dilemma for me. I can't deciede whether to eat them or make medicine out of them. I think they are one of the most medicinal mushrooms in the world right now. 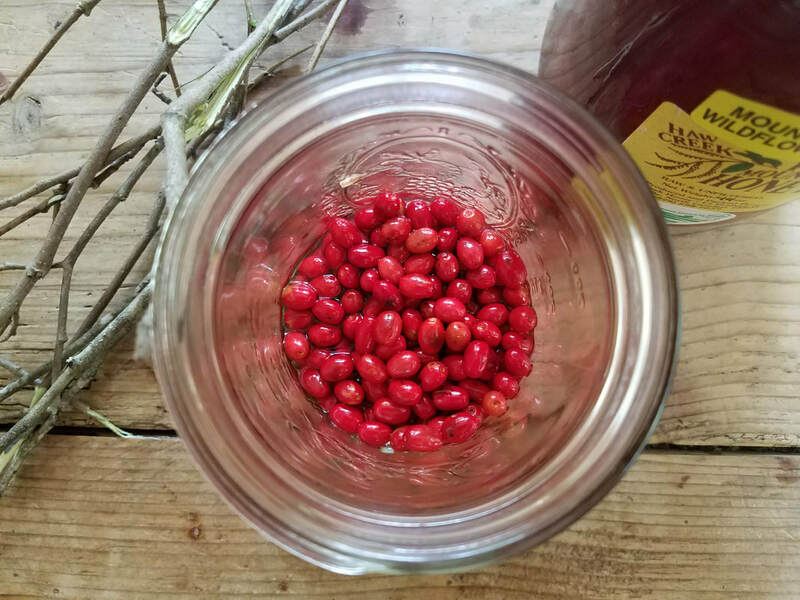 They are said to be basically a miracle for brain function and nerve regeneration, great for memory and learning, for Parkinson's, Alzheimer's, and ALS, and repairing nerve damage. I highly encourage you to do your own research. Again this one is very sponge-like, so definitely don't clean it with water. My advice would be to eat a little and make medicine out of the rest. They grow on several hardwood species, especially oak. That is all for now. There's so many more I could have included and some I could have left out, but they are all special to me. As always, it's a perfect opportunity for gratitude. They are giving of themselves for our food and medicine. The least we can do is say thank you. Please comment on your experiences with them below and which ones are your favorites. Forage on! Have you heard the Barbra Streisand song, People? While the rest of the lyrics can feel like a bit of an overly sentimental stretch, I can't stop pondering these first few lines. It plays over and over in my head. We all need people, right? And we can feel like the luckiest people in the world when we are surrounded and supported by great people, right? While I originally thought my mission was to (re)connect people with nature, the more years I spend teaching, the more I realize that people are seeking and needing connection with other people often equally as much. That's not just true for my students, but myself, too. It gets lonely working and teaching alone so much. I have so many talented friends, I figured why not collaborate?! That way I can share their gifts with my students, as well as my own gifts. I've had a dream for years now about partnering up with some of the best teachers I know. They teach amazing material, offering you, my students, a wider breadth of knowledge. The general idea is to create a whole weekend to immerse yourself in nature, to disconnect in order to reconnect, with nature, each other, to refill and rejuvenate. Called Retreat & Reconnect, I'll be offering a series of retreats where you get to spend two days walking the forest, learning basic botany, including identification of wild edible and medicinal plants, trees, and mushrooms; along with wild food cooking, herbal medicine making, and other awesome skills taught by someone amazing. 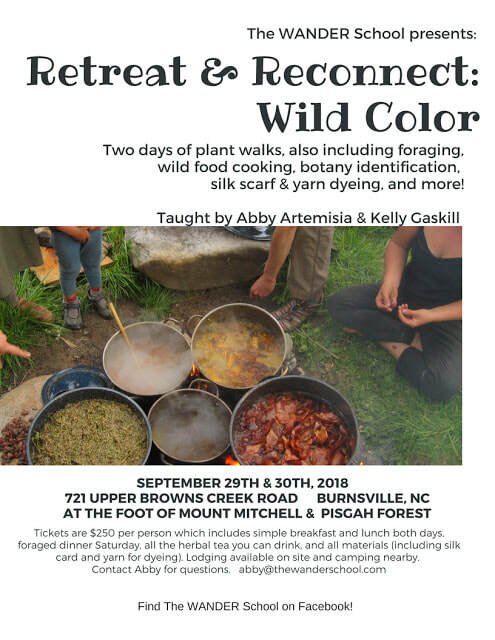 The first retreat is the last weekend of September and will be Retreat & Reconnect: Wild Color. 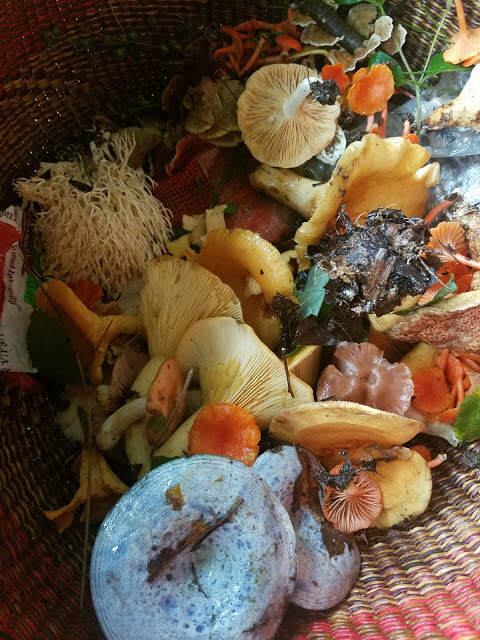 Along with wild edibles (for a fabulous Saturday dinner that we'll create together) and medicinals (for making our own tea blends), we'll be harvesting wild plants and mushrooms to make natural dyes. Then, with instruction from my fabulous friend, Kelly Gaskill, we'll dye silk scarves and yarn samples to show a wide diversity of colors you can make from natural materials. 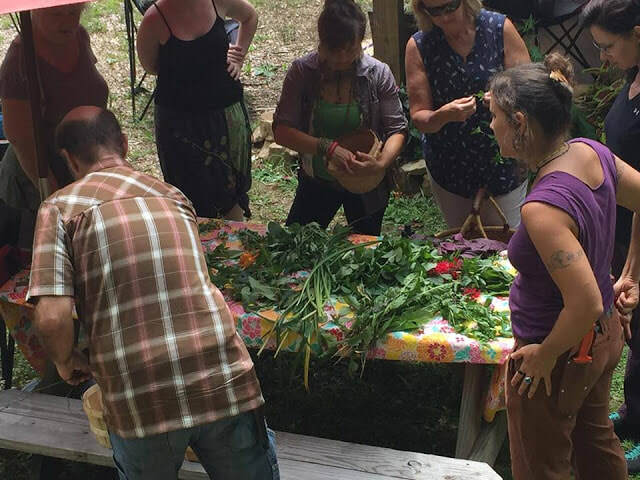 And that's just the first of many retreats to come, including subjects like clinical herbalism, wild foods cooking, permaculture, and primitive skills. We rarely take time to address our deepest needs, to retreat from the day to day stresses and noise and let ourselves relax and hear what our bodies, brains, and spirits are trying to tell us. A little bit of nature can go a long way. Register now (to ensure there's enough materials and food for you) and join us! Stay tuned for more upcoming retreats and let me know what you'd like to learn. 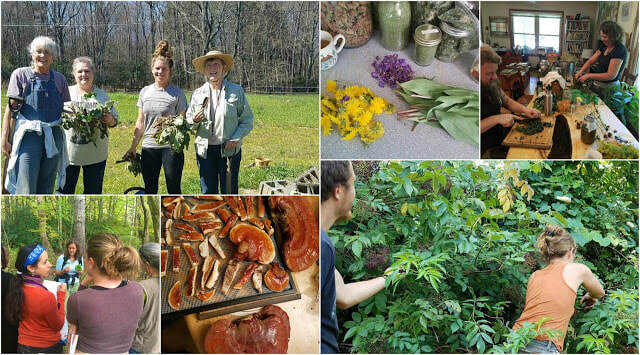 Also, check out some more exciting collaborations, like Trees: The Treasure in the Forest, a day long edible, medcinal, and permaculture workshop with my friend and amazing teacher, Doug Crouch, of Treasure Lake (in KY), and my upcoming Appalachian Wild Edible & Herbal Plant Walk in cooperation with my friends at Thrifty Adventures (in NC). Hope to see you here or there, in the forest and beyond! Reishi, also known as the mushroom of immortality, is believed to be one of the most medicinal mushrooms ever known. (I'm about to whip out some Latin, so I apologize to non-science nerds. You can just ignore it, if you want.) There are multiple different species in the United States. They grow mainly around the northeastern US on dying hardwood trees such as oak, elm, maple, beech, and hemlock. 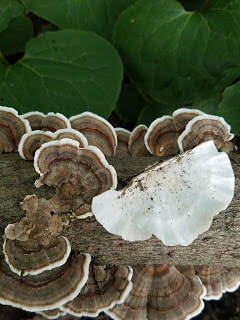 Ganoderma lucidum is the species mostly commonly utilized in Traditional Chinese Medicine. Ganoderma means something like, "bright skin," lucidum, "shining." In the Appalachian mountains of North Carolina, where I live, Ganoderma tsugae is the most common species, because it grows on dying hemlock trees (Tsuga canadensis, not to be confused with poison hemlock, Conium maculatum, in the carrot family). Unfortunately we have a lot of dying hemlock here, due to damage from the non-native insect the wooly adelgid. The past couple of years, I've found another species, Ganoderma sessile, growing on maple trees, when I've visited Ohio. Sessile means, "stalkless". There are other species, as well, and debate on how similar they are genetically, whether some may be the same species or not. Full of vibrant and healing energy, reishi is a very powerful ally. 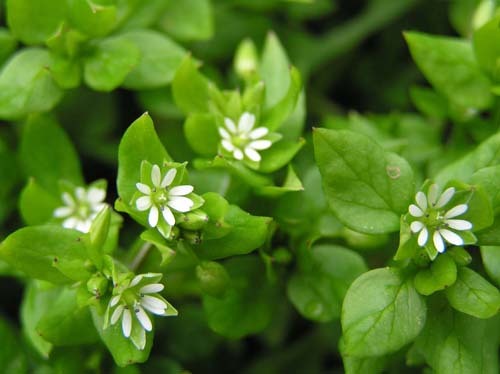 It is one of the most important adaptogen herbs in chinese medicine. It has been utilized for anxiety, high blood pressure, hepatitis, bronchitis, Alzheimer's, insomnia, and asthma. Some of its most famous benefits, are that it has been considered anti-carcinogenic (anti-cancer), immune boosting, life extending, and stimulating to brain neurons. Reishi is commonly taken by tincture, an alcoholic extraction, or by tea. Some people believe it takes a long time, 12 - 24 hours, to extract the constituents (medicinal components). If you harvest your own reishi, cut them into long, thin pieces before dehydrating. They're extremely tough and hard to cut once dry. They're dry once they break cleanly in half. 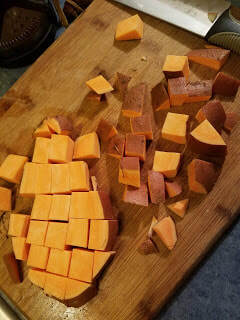 You can break them into smaller pieces and grind them in a coffee grinder or leave in small chunks, and cover with at least twice as much water. (You can add veggies and herbs, if making a stock, or other roots, if you want to make a tea blend.) Bring to a boil, turn heat on low, and let simmer for around two to twenty-four hours. The longer you simmer, the more water you need. Strain out reishi pieces and enjoy! Some of y'all who know me well, know I'm a traditional Herbalist, so I'm not always big on exact measurements. 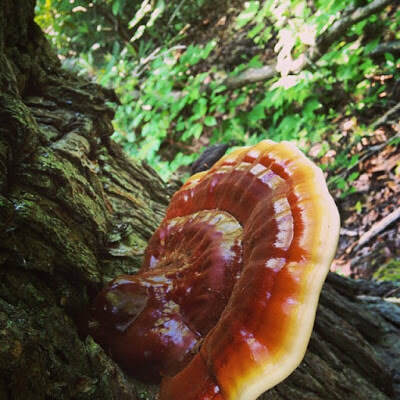 If you want more details, check out this reishi article from my friends at No Taste Like Home. Co-written with Savannah Smith, previous intern. 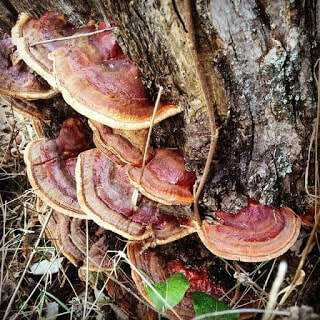 A republished blog just in time for reishi season. It's spring and seems like the warmth is finally here to stay in Appalachia. Yesterday, in the May rains that have been common lately, during my Wild Foraging and Herbal Medicine Making Apprentice Day, one of my students exclaimed how vibrantly green all the plants were. It's true, you can see the glow of aliveness in everything. Being a Florida born plant person, I admit winters are tough for me. I invite all of us to take some time to sit in the sun and bask in the beauty of everything awakening after the long, cold season. The early spring greens are transitioning from their tenderness to a harder fibrousness. At this point, they're not as tasty as raw salad greens. So what do we do with them? Cook 'em up! 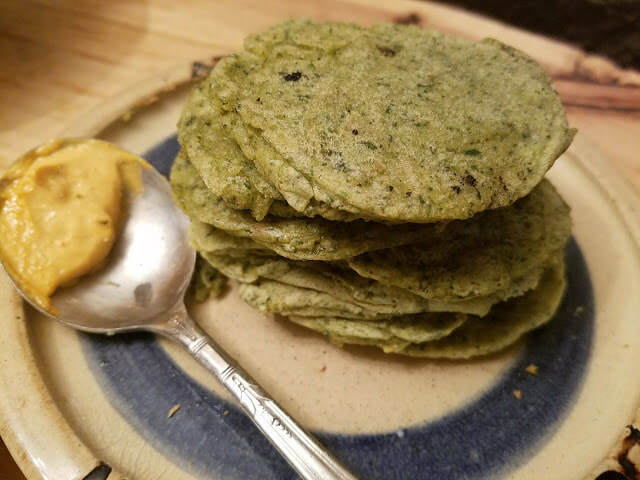 I found out from my awesome homesteading friend, Meredith (also the incredibly knowledgeable and generous author of the new super helpful website lymecompass.net all about her family's journey with Lyme Disease, as a way to help others on their journeys with Lyme and other tick-borne illnesses) who grows lots of nettles, about nettle pancakes. How did I never know about these before?! Apparently they are super popular in Nordic countries, and called nokkosletut. 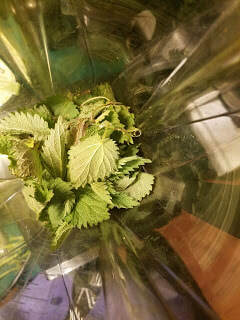 Stinging nettle, Urtica dioica, is the species most commonly thought to be medicinal. However, I like the taste of our wild wood nettle, Laportea canadensis, better. They are both in the nettle family, Urticaceae, with stinging hairs. Of course, to protect yourself from the stings, wear leather gloves, though the sting is medicinal, too, for arthritic conditions, gout, etc. I'll add any of a wide variety of wild greens to these, like dandelion, day lily, violet, and chickweed. 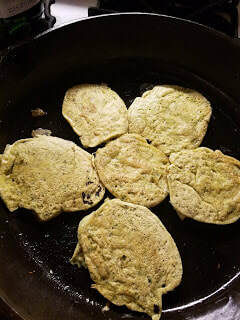 Just remember to make any bitter greens, like dandelion, a small amount of the total greens, or you'll end up with bitter pancakes. You might like that, though. Remember how great for us bitters are?! 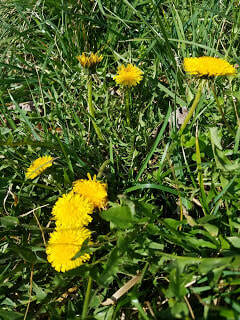 Dandelions are a great bitter for preparing the digestive system for fatty or meat-containing meals, and for toning the liver and gallbladder. These pancakes are pretty simple to make. Make them thinner, like crepes, for best results. As you can tell from the pictures, I'm not too concerned with making perfectly shaped pancakes. You could try to make some fun shapes, too, if you're feeling creative. I made these gluten and dairy free, with gluten free flour and coconut milk, but substitute your favorites. You could also make this vegan by using flax seeds or other egg substitute. Cultivated onions or garlic can also be substituted for the wild onions. These are so simple to make, I hope you try them in many different reincarnations with different greens throughout the various seasons. Let me know, in the comments, your favorite additions and how they turn out. One awesome topping I came up with is fire cider aioli! Just mix some fire cider and mayonnaise until it gets to your desired consistency. I added some ramp salt for extra yumminess! Combine all ingredients in Vita Mix or other food processor. Run until just well mixed. Add more oil to skillet over medium heat. Ladle batter into hot pan so you have small (two inches wide), thin pancakes. Cook two minutes or until edges start to dry and they hold together to flip. Flip and cook another two minutes or until done in the middle and light brown. Want to know more about what's growing on your land? Want to find out what you can safely eat or work with as an herb? I offer botanical property surveys just for you. You'll get to come out with me for a botanical walkabout of your property. Invite your friends, family, or neighbors, and make it a party! 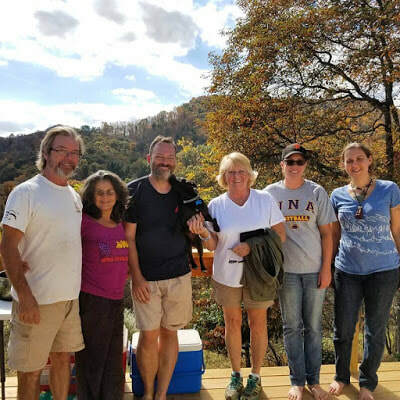 On one of my most memorable surveys, a client invited his neighbors and friends, who wanted to know more about what was growing in their region. We found a huge patch of hen of the woods mushrooms. Then we barbecued them and some burgers for a post-survey feast! The walk takes at least a couple of hours, and you will get to ask burning questions you've been dying to have answered. Afterward, I will provide you with a spreadsheet of the edible, medicinal, and poisonous plants on your land. Here's an example of what (a part of) your personal survey could look like. It is customizable so that you can reorganize it by common (English) name if you prefer. On my last survey, we found 72 species! The price is $150 for the first two hours and the spreadsheet (+ transportation fees), and $50 for each additional hour. If you have a large property, want something more detailed, or are interested in learning what is growing through each seasonal change, we can discuss how to make that happen. Email me now for more info, and to schedule. The spring calendar is filling up fast; get in touch now!